Each November, the Visual Arts Committee selects artists to exhibit their work in the gallery for the year after next with a Portfolio Review. A panel of seven local artists who work in different media review submitted images. Portfolios are chosen solely on the merit of the images entered and the artist’s resume. The deadline for submission to Portfolio Review is always October 31. Deadline: October 31, 2013 for the 2015 Gallery Year. The Visual Arts Committee of the Fairbanks Arts Association invites artists and artisans from Alaska to submit for review either slides or digital images of their work for possible solo or group exhibitions in the Bear Gallery for the year 2015. Submission to the Portfolio Review constitutes an agreement to meet the gallery’s scheduling needs for the exhibit year 2015 beginning January 2015. Any selected artist unable to meet the gallery’s schedule may have to resubmit for review in a subsequent year. Collaborative Defines artwork, not number of artists. Collaborative Artists may apply. Note: Group proposals requiring an entry fee cannot be submitted to Portfolio Review. Eligibility: An artist or a group may have an exhibition in the BEAR GALLERY once every four years. Artists who have exhibited prior to 2011 are eligible for consideration this year. Inclusion of your artwork in a curated, juried, or group show in the intervening years is allowed. Submit up to 10 images, an image list, and an artist resume including all contact information. You may also include a self -addressed, stamped envelope if you would like your packet returned. Digital images: submit a CD (please no DVD’s) or email to digitalfaa@gmail.com. Include an image list with name, title, media, dimensions and year completed. Do not include the artists name in the images or file names. Digital Images must be 300 dpi (not to exceed 3 MB each). IMPORTANT: Your images are the most important representation of you artwork. It is imperative that you provide images of the highest quality, showing a clear view of your work when projected. Resume: Artist resume or brief history, which includes: education and training, previous gallery exhibits. If necessary, a brief exhibition proposal may be included to describe your vision. Include ALL contact information: your current address, phone number, and email and how you prefer to be contacted. SASE (Self-addressed, stamped envelope) with sufficient postage for the return of your packet, if you would like your materials returned. This also applies to hand delivered submissions. Portfolios are juried each November by a panel of seven jurors who work in different media including sculpture, photography, painting and others. The jurors evaluate each portfolio and rate them on a scale from 1 to 5. The highest and lowest score are dropped and the remaining five scores are averaged to determine the applicant’s final score. 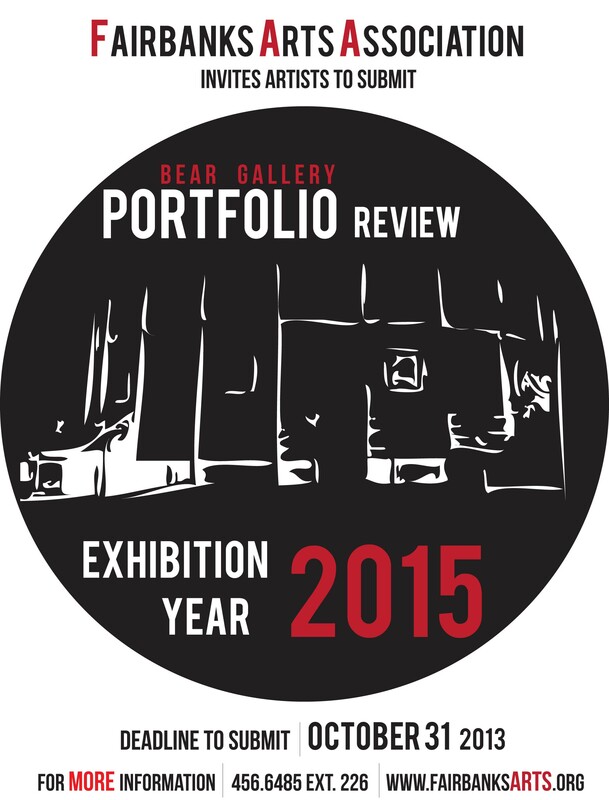 All artists receiving a score of 3.5 or above are then eligible to have a solo exhibit in Bear Gallery. The eligible artists are then offered the available gallery exhibit months in order from highest score to lowest. Consequently, receiving a score of 3.5 does not guarantee an exhibit. Individual artists are almost always offered half the gallery space and paired with exhibit by another solo artist or an FAA exhibit. For more information on Portfolio Review or how to apply please contact the FAA Associate Director at (907) 456-6485 ext. 226 or digitalfaa@fairbanksarts.org.